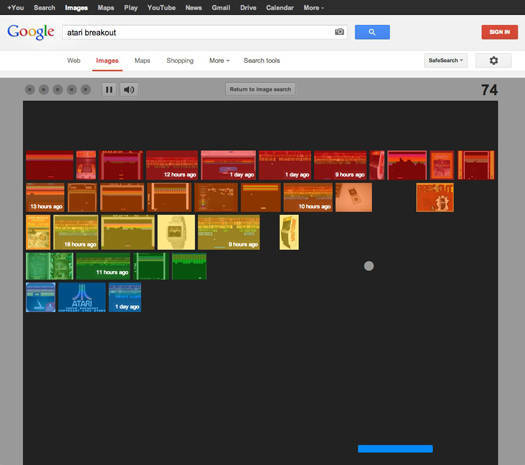 Google has added a playable version of the early Atari game Breakout to its Image Search system to celebrate the game's 37th birthday. To access the game go to the Google Image search page and enter "Atari breakout." The search results pages then form into five rows of bricks and the paddle and ball game commences under mouse control. Purists will argue Google should have gone for the classic, eight-brick opening screen, and worse, this version inevitably comes with a system to proclaim your score on Google+ once you're done. The original Breakout arcade game was launched by Atari in the spring of 1976 and was a development on the earlier game of Pong, created by gaming legend Allan Alcorn. Although the arcade cabinet housed a black and white CRT screen, the illusion of color was added with strips of colored cellophane. It became the top arcade game until the 1979 launch of Asteroids, had a successor in Super Breakout, and was one of the first games to be ported to the emerging console market and later to the PC and PlayStation. It also turned Atari into a gaming powerhouse, but Breakout's birth gives a glimpse into the dark side of two Silicon Valley legends, too. In May 1974 a "hippie freak" named Steve Jobs wandered into the offices of Atari and demanded a job. The 18 year-old lied his way into a $5 an hour technician job and became employee number 40 at the company. Even apologists for Jobs will acknowledge he had an obnoxious streak and was prone to roaming round the offices barefoot and calling other engineers "dipshits" when he spotted mistakes. He was too good at his job to fire, so management put him to the night shift to get him out of everyone's hair and he focused on tweaking game designs. When he heard about the Breakout game development plan, Jobs got his geeky childhood friend Steve Wozniak to come into the offices and demonstrate a home-built board he'd developed to play Pong. The copy was fairly basic, and it would display curses when the ball was missed, but what impressed the engineers was the simplicity of the design. Thy offered Woz a job on the spot but he said no, he was happy designing calculators for HP. Meanwhile, Jobs convinced the company to fly him out to West Germany to solve some hardware issues in their arcade games (which he did in two hours flat) and then jetted off to India in search of spiritual enlightenment. By autumn, a shaven-headed and saffron-robed Jobs returned and convinced Atari to rehire him as an engineer. A year later, Atari opened up an internal competition to design Breakout cheaply. Such games typically had around 100 Transistor-Transistor Logic (TTL) chips, which were a major manufacturing expense, and so Atari offered a $100 bonus per chip for designs with fewer chips than that. Jobs saw this as a way to fund a vacation at the All-One Farm commune in Oregon and enlisted Woz to work on the project. He told his friend that a 50-chip design would net the pair $700 and a 40-chip version $1,000 and then booked his flight to Oregon. By the time Atari signed off on the project, they had four days left. The two worked on the design non-stop (both catching mononucleosis in the process) and got the board down to 42 chips, before settling on 46 to solve stability issues. Jobs presented the system to Atari (which paid him $5,000 for it) then gave Woz the promised $350 and jetted off to his hippy hangout for a couple of months. It's no wonder punks warned "never trust a hippy." Atari found that out too, once they examined the prototype. "Ironically, the design was so minimized that normal mere mortals couldn't figure it out," said Alcorn. "To go to production, we had to have technicians testing the things so they could make sense of it. If any one part failed, the whole thing would come to its knees. And since Jobs didn't really understand it and didn't want us to know that he hadn't done it, we ended up having to redesign it before it could be shipped." They were forced to farm the design out to a team of consultants who came up with a system robust enough to make it through manufacturing. The game finally came out a year late and was an instant hit, but by then Jobs and Wozniak had moved onto other things – having officially formed Apple two weeks before Breakout hit the arcades. Woz said the chip designs he developed for Atari directly influenced his design of the Apple II, though he added both color graphics, cassette storage, and sounds to the system to play his own version of the game, called Little Brick Out.